To paraphrase Tolstoy, all exile libraries are alike, but each is different in its own way. The centerpiece sets of Goethe and Schiller that at home once signaled respectability and affiliation to German culture are now dead weight. But beyond that, each library has an individuality, representing a passage from a normal to an abnormal situation, and, in the best of circumstances, a triumph against adversity. So with the books in the present selection, which once belonged to the violinist Adolf Busch, his wife Frieda Busch, the piano virtuoso Rudolf Serkin, and his wife Irene Busch Serkin, all of whom came to settle on a farm in southern Vermont. They represent an itinerary, from the shards of the German and Austro-Hungarian empires to a remade Europe that eventually turned against their owners, a sojourn in Switzerland, and finally the establishment of a new and productive life in the United States. In its similarities the collection resonates with books we have from other sources, and we have included some of those cognates as well. Within the sections, with the exception of the first and last, items are listed chronologically so far as possible. All items are offered subject to prior sale. Prices are net. New York State sales are subject to 8.875% sales tax. Institutions can request post-payment with provision of a purchase order. Customers wishing to pay by credit card can do so through PayPal. We do not process credit cards. Customers in the United Kingdom and the European Union can pay in their own currencies; please inquire for details. Payment can otherwise be made by certified check, bank draft, or money order. Customs charges are the responsibility of the buyer. The date of issue of this list is February, 2019. Prices are subject to change without notice after December 31, 2019. All items are in good antiquarian condition unless otherwise noted. Minor flaws and marks of ownership have not been exhaustively described. For further information, please inquire. 38. Freyhold, E. F. Edmund von, Hasenbuch. Mit Versen von Christian Morgenstern. Wiesbaden (Zweigstelle), Insel Verlag, (1960). Oblong format. Boards. Insel-Bücherei Nr. 707. About fine. Modernized typography. First published by Cassirer in 1908. $35. 50. Mynona (i.e., Salomo Friedlaender). George Grosz. Mit siebenunddreissig Netzätzungen. Dresden, Rudolf Kaemmerer, 1922. Red boards ("Pappausgabe") with reproduction of drawing on front board. Very good copy, boards faded here and there around edges front and back. Autotype illustrations, some tipped in. Künstler der Gegenwart, Bd. 3. $60. A "bookplate," found loose in Wedekind's Oama, the only example among the books we acquired. 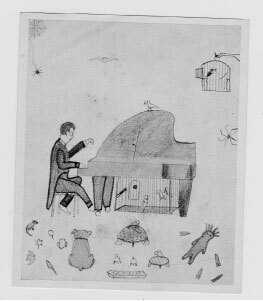 Perhaps it is a picture of Rudolf Serkin as drawn by a much younger Irene Busch. No one in the family seems to have had a private bookplate; Adolf Busch used a name stamp (see item no. 87).